This is a classic example of French simplicity and grace, and it’s one of my favourite desserts. I found it while living in Lorraine, a region in the northwest of France, where this kind of straight-forward dish is common. In a large bowl or mixer, combine flour, 1/2 cup / 125 g butter, and salt and mix, gradually adding the water. Work dough just until it forms a ball. Roll out on a well-floured surface to fit a 9 inch / 26 cm pie plate or flan pan. (If you have one with a removable bottom, that works great.) Prick the pastry in the bottom of the plate gently with a fork, as well as gently pinching the bottom corner along the bottom and side edges (this will keep the pastry fro being tough where it is thickest.) Sprinkle with flour and set aside. In a small bowl mix together the egg yolks, remaining 5 tbsp / 75 g of butter, 10 tbsp /150 g sugar and the juice of 1/2 grapefruit. Add the powdered almonds and mix well. Set aside. Beat the egg whites to a stiff meringue and then fold them into the almond mixture. Pour this into the pie plate and place the pie in the oven at 375 F / 190C for 25 minutes, checking after 15 minutes. If the filling begins to brown too quickly, cover it with aluminum foil for the remaining time. Wash the whole grapefruit and pat dry. Cut in half across the middle, then into quarters. Slice each quarter into thin slices. In a large saucepan bring to a boil 7 tbsp / 100 mL water and the remaining 7 tbsp / 100 mL sugar. Boil for 2 minutes, then add the grapefruit slices. Cook the slices until their skin is translucent. Remove the slices with a slotted spoon and place them, windmill style, on the pie. 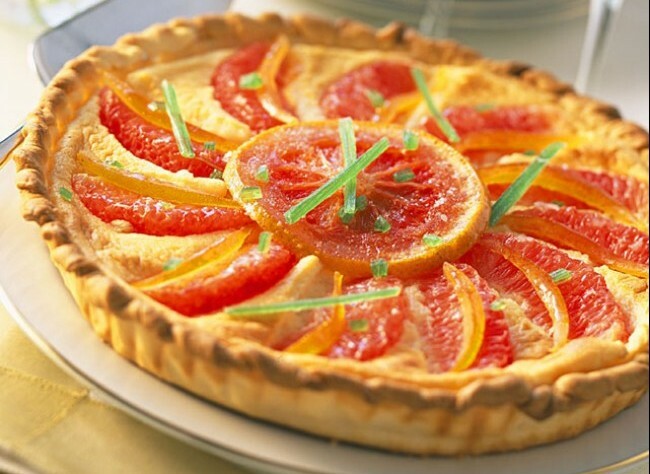 Place the pie in a 450F / 230C oven for 5 minutes, to caramelize the grapefruit slices. Reduce the syrup used for the slices by half, by boiling it. Remove from heat, add the brandy and pour this over the hot pie. Let cool, then serve. If you want to “dress it up” a bit, add a dollop of whipped mascarpone cheese.